To begin with, I must state that I write this article not with the purpose to advocate for any of the candidates but to address various scenarios that a new President may bring to us after the election. Ms. Hillary Clinton is running for a President on behalf of the Democratic party. Traditionally, her party supported immigrants, but we cannot say that its leaders always and 100% united with them. For example, recent administration decision is going to start deporting to Haiti its nationals after years of granting to them TPS status; the Obama administration failed to accomplish promised Immigration reform and in fact organized jails or prisons for women and children… We should, however, not forget the regulations allowing “dreamers” to apply for an employment authorization, I 601A provisional waiver and parole for children from such countries as El Salvador, Honduras or Guatemala. Even though Mr. Obama belongs to a democratic party, it did not help him to pass life changing Immigration laws we all hoped for. Hence, it would be safe to conclude that it is not the only President who plays a crucial part in Immigration future. Mr. Trump would like to become a President as a candidate from the Republican party. 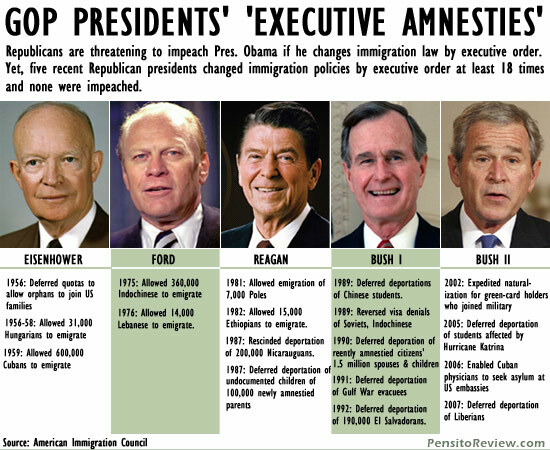 Under the republican president Ronald Reagan, the country saw the biggest “amnesty” for the immigrants, the Bush administration expanded Reagan’s immigration action, and of course, many Republican presidents issued executive order deferring deportation of hundreds of thousands of nationals of certain countries. As such, it is not the identity of the president per se that determines the Immigration future, but rather: the leader’s ability to unite forces around him/her in order to promulgate the laws and ideas, and public’s participation and advocacy. Most laws and changes come from the need, not want to change them. The need comes from the society’s explicit desire to bring the change. For example, why do we have the laws protecting coal mining companies and do not have laws that would protect undocumented workers from illegal harassment based on their status? It is because Marthas, Ivans, Consuela’s, and Li’s are not represented in Congress, because their voice is not heard; because at the moment when the Congress decides an important issues, people without Immigration status do not call their “legal” friends and do not ask them to contact their Congressman to vote a certain way, and because the number of groups advocating for these people on a serious level is de minimal. We can all sit and guess who the next President would be, but I can assure you of one thing: whoever it will be, this person is not going to change the Immigration reality in one day like in a fairytale. It is not going to be changed to a negative by Mr. Trump and it is not going to be changed to a positive by Ms. Clinton. The issues are so controversial that until the majority of those who need the law to be changed would not start advocating for it, nothing significant will happen, and it does not matter who would be in the Oval office in December, Reds or Blues.